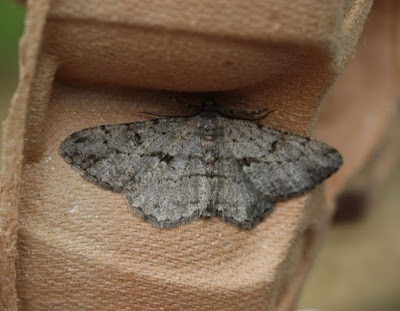 Last weekend was National Moth Night, an annual three-day Lepidopterist extravaganza. At Shandy Hall, we celebrated by trapping on both Thursday and Saturday night –not an unusual occurrence, but done with a bit more zeal this time. In our first trap on Thursday, we had quite a few stunners! Although the Angle Shades (Phlogophora meticulosa) is rather common in Britain, it is an unequivocal beauty. It gets its scientific name from the way that it quivers before taking flight. 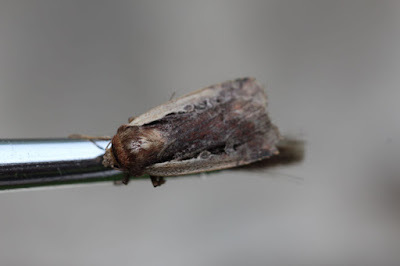 Resting, this moth has plicate wings (meaning that they are folded like a fan), which Linnaeus felt was its way of shrinking into itself, as if fearful. We were graced with another grassy sojourner, this time a Green Arches Moth (Anaplectoides prasina). 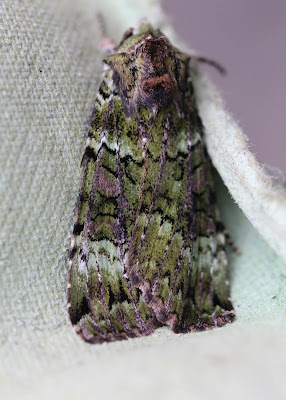 This moth is a beautiful deep emerald with complex etchings on its forewings. The one pictured here is in near perfect condition, although its plethora of color and intricate markings make it tricky to focus a camera on. 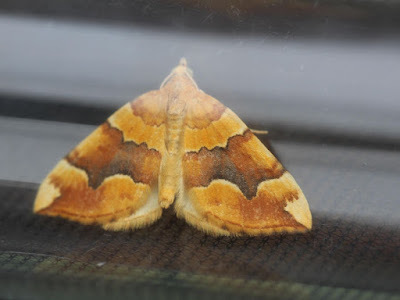 The Barred Yellow (Cidaria fulvata) has been featured on the blog on a number of occasions, and it’s no wonder as it is a very pretty and striking moth. 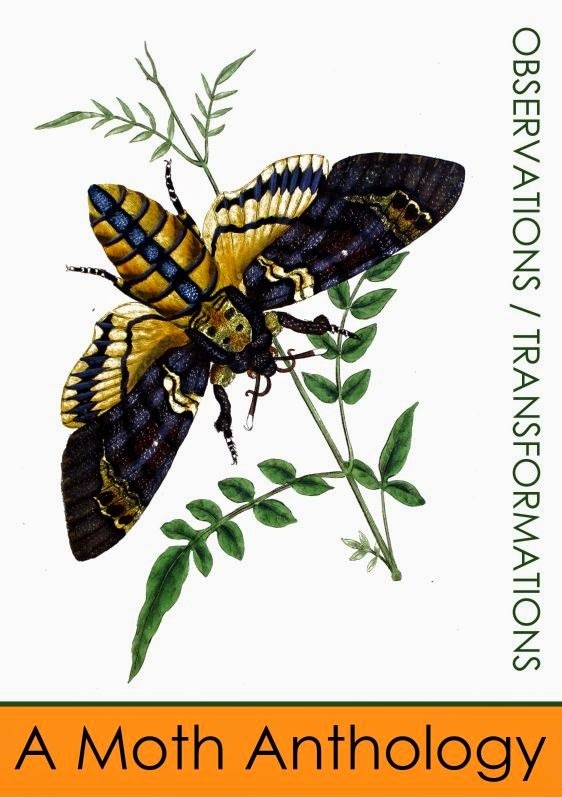 In Humphreys & Westwood, the entire life cycle of this moth is depicted, from caterpillar to chrysalis to moth. I’ll only include the illustration of the adult moth in this blog, however, because drawings of larvae and an oblong don’t make for particularly thrilling content. On Saturday night there was a storm earlier in the evening, but thankfully it cleared up just in time to set the trap. 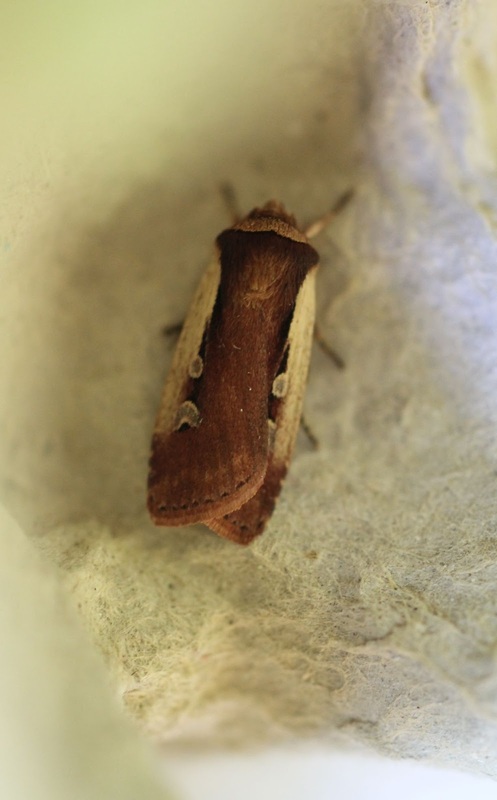 Here a worn Flame shoulder (Ochropleura plecta) clings to a paintbrush. Its name comes from its pale costal streak and literally means “pale twisted rope.” Its picture in Humphreys & Westwood beautifully showcases this beam of light on its shoulder. 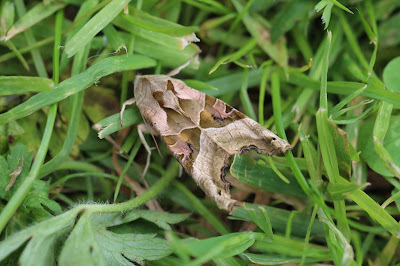 I've added another image (directly below) of one that was photographed from the first trap to show how the colours are much richer when the insect is freshly hatched. And an illustration to show the moth in flight. A prime Willow Beauty (Peribatodes rhomboidaria) was in the trap as well; a sophisticated and understated moth.